Why are we chilling in warm Chile? Chile is the country shaped like a long strip of bacon applied to the southwest side of South America. It is approaching fall here and still warm in the Patagonian Rain Forest with beautiful lakes, mountains and live volcanoes. 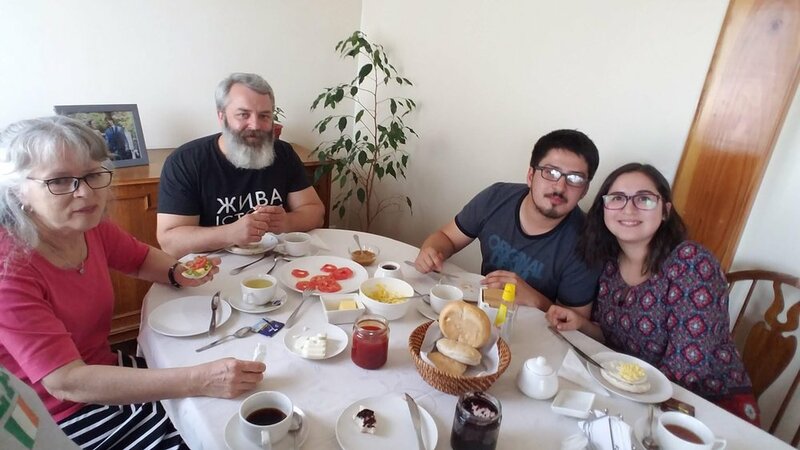 Our granddaughter Naomi and her husband Jorge, a civil lawyer, live in a forest cabin near the village of Panguipulli which is about 700 miles from the southern tip of the continent. They have blessed us with our first great-granddaughter Pippa who is why my son Caleb, a grandpa now, his son Mishael, and Nancy and I are here. A relaxing lunch outside Naomi and Jorge’s forest cabin with a babbling brook just feet away. Before coming we were invited to do two weekend seminars on biblical church leadership and the Christian family for Naomi and Jorge’s church, The Christian Community of the Forest, which is only a year old. It was exciting to worship and fellowship with many new believers. They had good questions and were hungry to know the Scriptures. Naomi and others translated our sermons and seminars into Spanish. God was doing a work here that we suddenly found ourselves a part of. We also were invited to homes to visit with church leaders like Pablo and Migno. He is an ER nurse but also preaches most Sundays and is is doing correspondence courses on ministry since there is little opportunity for formal training in the country. Mignol is an architect but also studies with Pablo. They had many questions on preaching, teaching, how to develop the church, the family, and dealing with sin problems. Pray for them as they grow and help lead the church in unity. Pablo and Mignol invited us for coffee and questions about ministry. Chile has only 18 million people but is a unique place to do mininistry for many reasons. Their Atacama desert is the driest place in the world with no rain for 400 years. A few people live there. Only in a few small areas it rains every three or four years causing beautiful blooming flowers. This is a good illustration of how spiritually dry some places are until the Gospel causes spiritual life to bloom as we saw. Chile also has the biggest open pit copper mine in the world which is three miles wide by two miles long and over half a mile deep. So people do have jobs here. You probably have copper house wiring from it. They also have volcanoes with as many as six in a close cluster. Many are active and can be seen smoking where Naomi and Jorge live. Here the world’s largest earthquake happened in 1960 leveling thousands of buildings and creating a tidal wave killing people in Hawaii, Japan and the Philippines. It was so large the Richter scale pegged out, therefore the true intensity is unknown. In the last two weeks over 25 quakes have taken place. That is normal here and a reminder that the largest ever earthquake is still coming (Rev. 16:18). I will happen before Christ returns in judgement on the earth. Chile rocks because it needs the Gospel now. By the way, hot chili was not invented in Chile. Most historians believe it was invented in Texas. But Texas needs the gospel too. Therefore pray for Chile as a unique place where some of our family is involved in ministry and a new generation is coming. Pray The Christian Community of the Forest will grow in maturity and size and impact in this small but unique country.